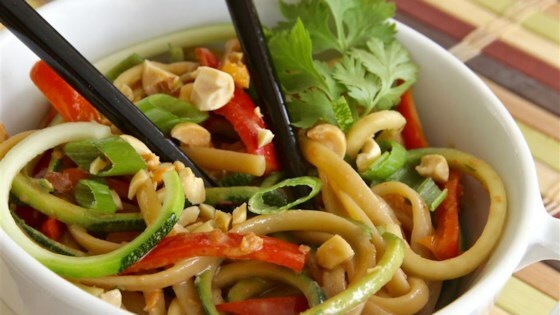 "This is the best peanut stir fry sauce I ever tasted. I like to double this recipe to make more sauce to pour over rice." Combine vinegar, soy sauce, peanut butter, brown sugar, garlic powder, ginger, cayenne pepper together in a saucepan over medium heat; cook and stir until brown sugar is dissolved and sauce is smooth, about 5 minutes. I loved this! Cut back to 1/2 tablespoon of rice wine vinegar and it was perfect! Enjoyed it over zoodle stir fry! Love this sauce! Nomnomnom. Simple but delicious recipe! Soba noodles, peppers, snow peas, carrots, onion and chicken... perfect healthy meal!